Yep, your storage unit/ garage/closet may be filled with various camera bags collected through the years, and it becomes like Goldilocks and the 3 bears x 100. This one is too small, this one is too big, and this one is just right. The truth is that they are all just right, but each one has it’s purpose. And we are big proponents of the right tool for the right job. As we travel from either events, trade shows or art fairs, you dress appropriately. Just like the bag that carries your gear. The disguise part is pretty great, as it looks like a basic, modern, business case. Comfy shoulder strap is included. True, that a modern business case will most likely have a laptop, so it is still a bit of a target, but there is now way around that concept. Like all of the great designs from ThinkTank, this one has all of the genius hidden away from the general public. First of all, we fit a Full size DSLR in the top center, with a Newton Bracket piece in place, and a 24-70 2.8 lens on and ready. One one end of the top we have a 70-200mm, 2.8, and on the other, a speedlight with a 20mm tucked on the bottom. In one end space, we’ll throw a Gorillapod. On one side, we carry an iPad, and bluetooth keyboard in a slot, and a folding tripod stand for the iPad, with a charging block and cable underneath, in an end partition. 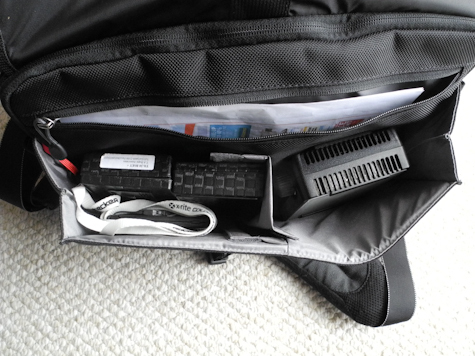 Sure, you could fit a 15in laptop in there, easily. On the other side, let’s unzip and have a look: we have a full array for specially designed pockets to attach: the Pixel Pocket Rocketâ„¢ media wallet, batteries, business cards, pens, mini flashlight,a mi-fi card so we always have internet access, and maybe a power bar. Or a coupla 5 hour energy drinks. So that’s the zippered flap. Under neath the flap is another compartment, usually divided into 2 parts. 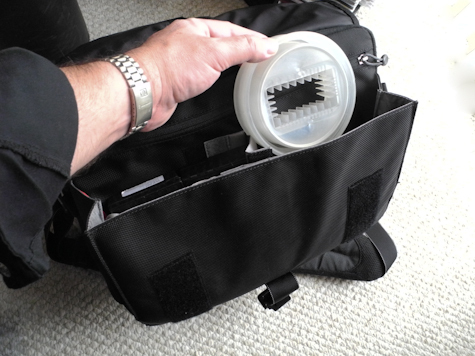 In here we’ll carry a Flip Video and a small sound recording device, for on the fly opportunities. And the folding Gary Fong LightSphere. 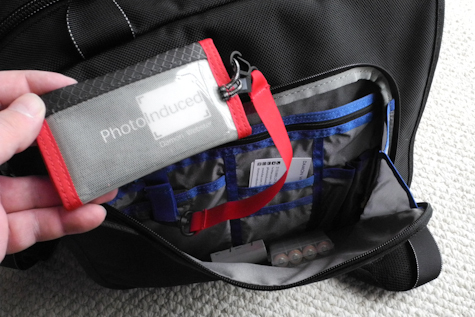 We are flipping between the ExpoImaging Rogue Flashbenders, and those will slide easily all over this bag. Plus this is where the Newton bracket may travel, although, once ready for action, that is placed into the main middle compartment. You can always go for a CB Mini bracket is that is your bracket of choice. 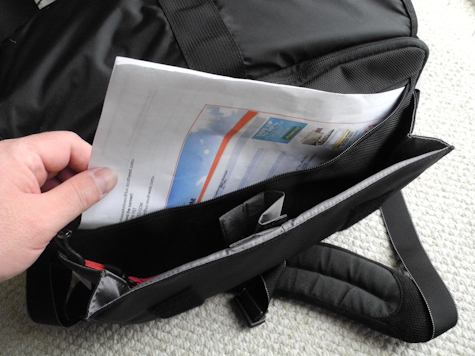 Behind these flaps is a zippered compartment, running the length of the bag. Perfect for documents and anything flat you may want hidden way. 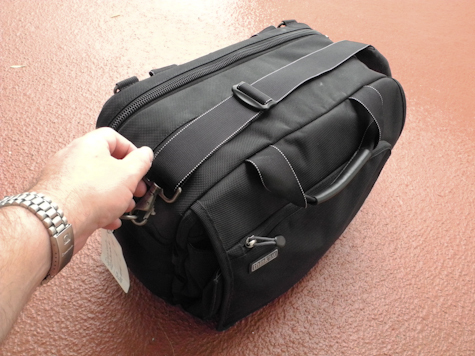 OK, there is a fabric flap that can be slipped over a roller bags handle and transported like a charm. OR: zip up the bottom and you have another pocket. It has velco on the top, so you can keep what’s in there, in there. 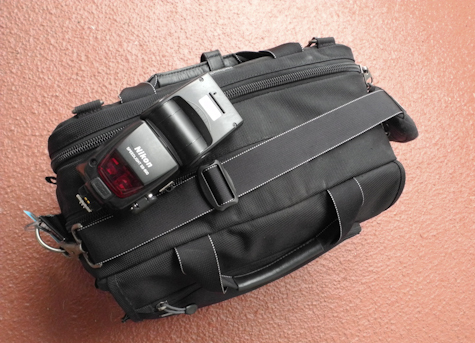 Another way we load this up, is if we are doing a video interview on the road, we leave the 70-200mm behind, add an HD compact vid camera to that slot, and in the flap/pocket places on the side, we add a Lav mic, with back-up, a mic transmitter receiver pair, a Litepanel Micro, and some earbuds. And yes, that is an X-Rite Passport colorchecker, which is always in our bag, somewhere. This way we are prepared to shoot a good interview with quality sound, in a fast, compact set-up. 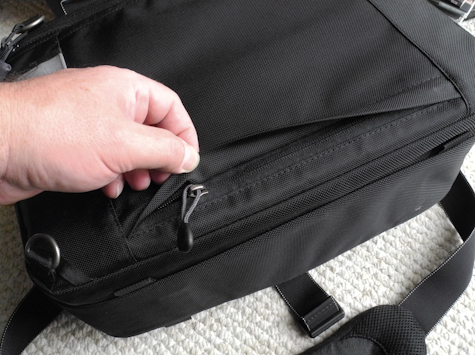 Or you can use one of the 2 stretchy pockets on either end and put a digital recorder in one of those. A Zoom H4N fits perfectly. And this bag has been holding it all, and in the right places. Once the shoot is done, the Disguise part comes into play, and the bag is loaded, closed, and slipped onto a shoulder or walked out by hand. 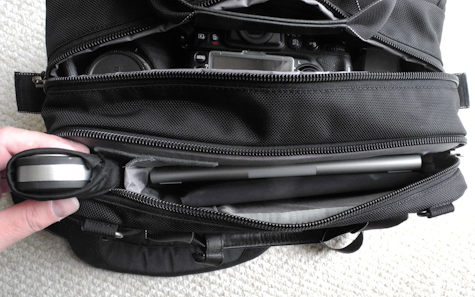 Highly recommend this bag as a great all purpose shooting bag, for multiple occasions. 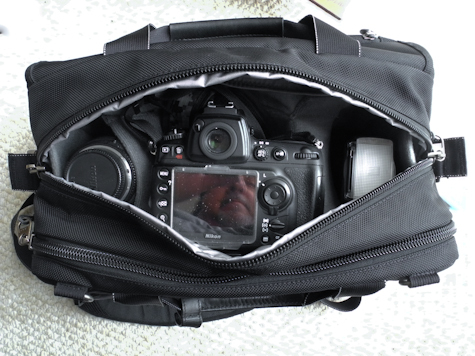 You could squeeze another body in one of the side pockets or high end lens, but perhaps the size up from this, would be better. 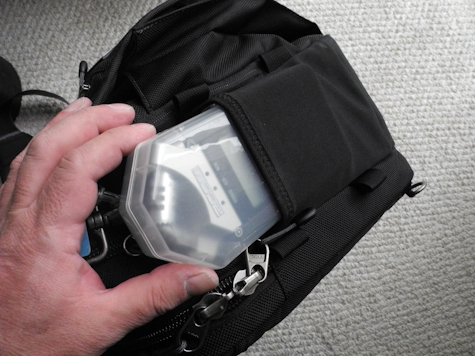 The other thing you always have to remember, is it may fit all you need, but it may get too heavy, so you may want to build your camera for carrying in to the venue and load the bag with extra gear. All loaded, ready to go, this bag weighed in at 18.6 lbs. That’s what our Balanzza said. You do use one of those right? Weigh all your bags, before you get to the airport? Time and dough saver. 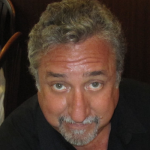 From what we’ve seen and used from this product line, ThinkTank is our first choice.